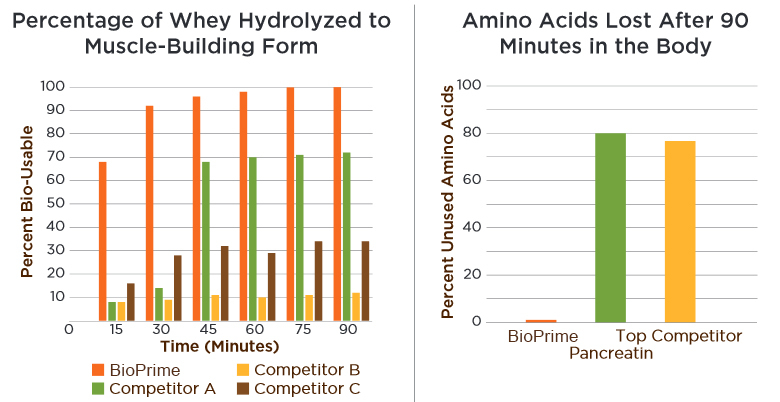 enzyme used to pre-digest the whey protein breaks it down to the smallest, most bioavailable (usuable) form possible. blocks of your body) to enter your bloodstream within minutes after it has been consumed! BioPrime is a bio-sufficient protein supplement designed to build muscle mass and accelerate muscle recovery when used as an ingredient in protein supplements or meal replacements. It digests protein into a bio-usable form, taking advantage of the availability of essential amino acids for building muscle and improving muscle recovery. It greatly reduces the discomfort typically caused when protein is not broken down into the smallest composition. It maximizes the performance benefit of protein supplements by assisting the body in absorbing more protein rather than excreting it. Plus, It's Made with 100% Pure Stevia!